Soft and chewy keto chocolate cookies are made with nut butter and sweetened with stevia. Beware – they are addictive! You are going to love these soft and chewy keto chocolate cookies! I worked really hard on this one. Sometimes I get an idea for a recipe, perform quick Internet research, come up with a recipe, and it’s an immediate success. Other times, I have to keep trying and tweaking until I get it just right. Ever since I started using stevia in my baked goods, this is usually the case, because removing granulated sweeteners, or even liquid sweeteners, from baked goods, requires some major adjustments. This is one of those recipes where I had to make quite a few experiments until I got it right. I tried to adapt several recipes for keto chocolate cookies that I found online. For some reason, they all turned out really dry. On the bright side, any recipe that causes me to overeat is an excellent recipe. These keto chocolate cookies are thick, soft and chewy. This is a big (huge!) plus if you’re like me and prefer your cookies soft and chewy. If you prefer crispy cookies, then this recipe is sadly not for you. It’s an easy recipe, with one big caveat: this is not a foolproof recipe. You will have to adjust the amount of water you add based on the consistency you get in your own kitchen. This will largely depend on the nut butter you use. Nut butters vary greatly in their consistency. Even when using natural creamy nut butters, which is what you should use to make these keto chocolate cookies, their consistency can be quite unpredictable. You can pretty much use any natural creamy nut butter you like. I used sesame butter (tahini) by Achva, which is quite runny as you can see in the video, and I needed to add a total of 1/2 cup of water to the batter to get a nice and smooth consistency. I assume you will need to use a similar amount of water, but I can’t know for sure. So my best advice to you would be to adjust as you go. You want the batter to be thick and smooth (the video shows you how it looks right before I scoop the cookies into the cookie sheets). You don’t want the batter to be sticky or dry, but you also don’t want it to be thin and liquid. Thick, smooth and easy to mix is what you’re after. I recommend using natural cocoa powder in this recipe. It’s acidic and will react with the baking soda, helping the cookies become nice and tender. Dutch processed cocoa powder will state that on the container. Sometimes it will say “alkalized,” “European style” or “Dutched.” I will note, however, that Cooks Illustrated claims that you CAN use them interchangeably. But I haven’t tried that with this particular recipe. What about leftovers? I keep leftovers of these keto chocolate cookies in the fridge, in an airtight container, for 3-4 days. I warm them up very gently in the microwave, 5 seconds per cookie on 50% power, before enjoying. Wonderfully soft and chewy keto chocolate cookies are made with nut butter and sweetened with stevia. Beware: they are addictive! In a medium mixing bowl, whisk the nut butter with the eggs until smooth. When mixture becomes sticky and difficult to mix, start adding water gradually, a tablespoon at a time, until you reach a smooth consistency. You will likely need to add 1/4 cup water. Whisk in the stevia and, if using, salt. Using a rubber spatula, mix in the cocoa powder. Just as in step 2, you want a smooth, easy to mix batter, so add water until you reach that consistency. How much water you will need to add depends on the consistency of the nut butter you use. I usually end up using a total of 1/2 measuring cup of water in this recipe. So I add about 1/4 cup in step 2, and 1/4 cup in this step. Using a cookie scoop, or a 2-tablespoons measuring scoop, spoon 18 mounds of the batter onto the prepared baking sheets, spacing the cookies 1.5 inches apart (they expand as they bake). Do not flatten the mounds. Top each cookie with 5-6 chocolate chips, gently pressing them in. Place the cookie sheets on the middle and bottom oven racks. Bake the cookies for 8 minutes. The cookies will be very soft at this point, but they will set as they cool. Don’t try to remove them right away. Cool the cookies 10 minutes in the pan, on a cooling rack, then use a cake server to carefully transfer the cookies directly to the cooling rack to cool completely. Do let the cookies cool completely – about 20 more minutes – before serving them, or they will still be the wrong consistency - too soft. 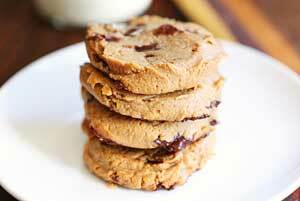 Once completely cool, you can store leftover cookies in the fridge, in an airtight container, for 3-4 days. Very gently heat them in the microwave, 5 seconds per cookie on 50% power, before enjoying.